4G Instant connect technology. Comes pre-configured, just turn on and view from anywhere Instantly. The RD-85EZ is a mobile camera system that can be monitored and controlled remotely. This system Includes a 1080P color PTZ camera, Pre-configured cellular wireless 4G/LTE built-in modem and a super duty Rechargeable mobile battery pack with 24Hr battery life. 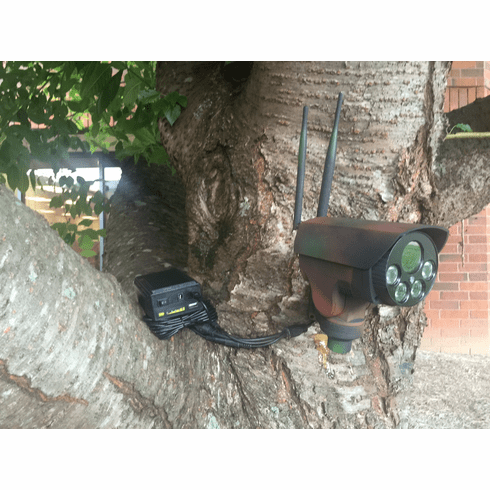 The camera and its battery can be mounted to a tree or anywhere else with just a couple screws for easy setup and breakdown. The camera's 10x motor-driven optical lens has digital multiplier providing higher total zoom. Pan, Tilt, and Zoom functions can be controlled automatically and precisely from anywhere in seconds. These features and much other features can be found on the camera's built-in web-server. The RD-85EZ camera system comes with a DVR video recording software that can connect up to 128 RD-85EZ cameras. The RD-85EZ has a high performance low-light Day/night HD 1080P sensor. The Day/night option can be enabled or disabled instantly. When enabled, the camera can switch into Black/White night mode when surrounding light is low. 4 IR LED Lights will illuminate about 100 feet in the total dark conditions. Auto Focus can be enabled to immediately adjust clarity when the camera is zooming in and out and/or Panning and Tilting. The RD-85EZ's 4G/LTE wireless network makes connecting to the camera easy. Zero configuration, zero setup. The only setup is connecting the battery and turning power on. When the battery is connected, full access to the camera will be available in less than 1 minutes by any remote PC or mobile phone. All these features make the RD-85EZ the best tool for law enforcement tactics, natural disaster evaluation, public events, hazardous environment monitoring, remote monitoring, construction management, and any other operation where a camera would be safer and more practical than an actual person.